Gerard van Honthorst was a Dutch painter in the style of Caravaggio, who popularised the technique of ‘chiaroscuro’ that draws on the contrast between light and darkness. Van Honthorst used this to great effect in this painting from 1620 entitled The Childhood of Christ. It depicts Jesus as a boy, apprenticed to the vocation of his human father, a carpenter. point towards the vocation conferred on him by his Father in heaven: to be the light of the world. Jesus worked with wood all of his life. As a pupil of his father Joseph he learned about the properties of different trees and the ways to prepare and season timber. He discovered especially how to work with the grain of the wood in order to add to the strength and beauty of what he was fashioning. He was a master carpenter. From creating with wood Jesus spent three years working on the hearts and minds of his disciples. Then on his darkest day, the first Good Friday, it was wood which mastered him. With hammer and nails Roman soldiers hung the carpenter-Saviour on a rough wooden cross. From this great reversal came the undoing of sin and the dethroning of darkness and the reconciliation of all creatures to their creator-God. May our lives now be fashioned again according to the grain of the universe – adding strength and beauty to our relationships and our work, to our churches and our communities. Gerard van Honthorst: The Childhood of Christ, 1620, oil on canvas, 137 x 185 cm, Hermitage, Saint Petersburg. Gerard van Honthorst (1590-1656) was born in Utrecht in The Netherlands. He studied with his father and Abraham Bloemaert. He soon went to Rome, where his night paintings caused such a sensation that he was known as Gherardo delle Notti (Gerard of the Night Scenes). 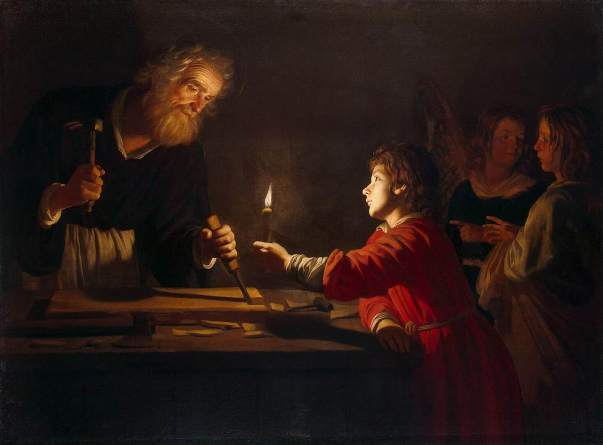 The lighting was derived from Caravaggio's works and Honthorst played a crucial role in bringing knowledge of Caravaggio and his followers to the North. Many painters, including Rembrandt van Rijn and Georges de la Tour, were influenced by Honthorst's Caravaggesque pictures. After nearly ten years in Rome Honthorst settled in Utrecht in 1620, where he soon adopted a much lighter palette. In 1628 he was called to England to paint the royal family. There he made portraits in the manner of Anthony Van Dyck. Honthorst spent the rest of his career as court painter at The Hague, where he largely devoted himself to portraits, becoming one of the few seventeenth-century Dutch artists to earn an international reputation. Jonathan Tame is passionate about helping Christians overcome the 'sacred secular divide' and learning to think biblically about all of life. To that end he set up Quo Vadis Cafe in Cluj, Romania, brought the monumental Invitation/Decalogue sculpture by Liviu Mocan to Geneva for Calvin's 500th anniversary, and now directs the Jubilee Centre in Cambridge, England, a catalyst for social reform.